Ricky Gervais made trans jokes in his Golden Globes monologue. And they failed miserably. 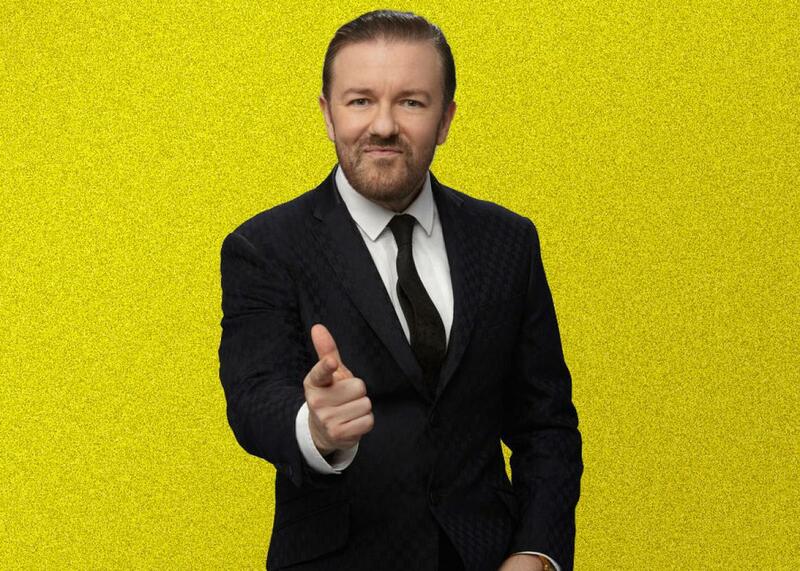 Ricky Gervais, host of the 2016 Golden Globe Awards. The phrase “transgender tipping point” has been bandied about a lot since it was first introduced on the cover of Time, alongside Laverne Cox, back in May 2014. Generally, it’s used to point out the rapidity with which trans issues—if not yet acceptance—have entered the mainstream consciousness. But at Sunday night’s Golden Globe Awards, I think we reached another trans tipping point, this one having to do with cheap trans-themed jokes. Host Ricky Gervais began his monologue with a “Bruce Jenner” jab, in the process flippantly commiting at act of “dead-naming,” and he continued with some riffing on what Transparent star Jeffrey Tambor does with his testicles while in costume as Maura. But as I say, I’m going to be nice tonight. I’ve changed. Not as much as Bruce Jenner, obviously. Now Caitlyn Jenner, of course. What a year she’s had. She became a role model for trans people everywhere, showing great bravery in breaking down barriers and destroying stereotypes. She didn’t do a lot for women drivers, but you can’t have everything, can ya? Not at the same time. … Yes. Yes. That is the level. An old man pulling me off. Again. Um, at least Jeffrey tambor did it in a dress. Um, what a year he’s had. Oh. What an actor, what a role. Every day, he has to put on all that women’s clothes and the hair and makeup and let people film it. That takes balls. So, I don’t know how he does it. I really don’t. I’ve seen his balls. They are huge and long. I don’t know he tucked them in the bra, that thing push them out the back and let them hang out, like a bulldog? No one knows. I love Jeffrey Tambor. Gervais is clever enough to temper the outright offensiveness of these jokes with seemingly politically correct followups and praise (as well as an arguably fair dig at Jenner’s involvement in a car accident earlier this year). But the fact remains that the crux of the humor lies in something being “funny” about trans-ness or its fictional representations. Or at least, it would have been had anyone found the jokes funny. Hearing Gervais, my cringing at his comedic choice faded into a modicum of relief when it became clear that very few in the room were laughing. And when the camera cut to Tambor—who has been more or less impeccable on trans issues since starring in Transparent—he responded with a grim look of disbellief rather than a smile. Gervais clearly felt that “men in dresses” and genital conjecture was a strong place to start his little routine—but, thankfully, his feeling was clearly wrong. Of course, Gervais’ trans jokes falling flat doesn’t mean they didn’t still add yet more anti-trans sentiment to the world Sunday night, but hopefully the dour response will dissuade anyone else from following in his smarmy footsteps on a national stage in the future.